Much coverage has been given to MIT researchers Esther Duflo and Abhijit Banerjee’s new book, Poor Economics: A Radical Rethinking of the Way to Fight Global Poverty. Banerjee and Duflo are well-known here at MIT for their use of randomized control experiments to test the means of poverty alleviation and their co-starting of the Jameel Poverty Action Lab (J-Pal). 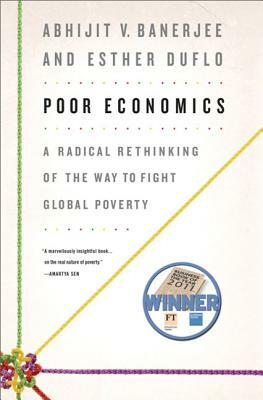 The 273 pages of Poor Economics shares the results of their research – and starts to fill in the gap between economist Jeffrey Sachs’ (aid breaks the poverty trap!) and William Easterly’s (free markets and provide incentives, people will solve their own problems!) theories on development. Banerjee and Duflo’s work raises oft-debated questions such as what really supports the use of bed nets in malaria infested areas, when is microfinance useful, and why, given the availability of education, are more individuals not receiving quality education? What is actually working? There are many good intentions in development work (regardless of the location); being able to learn from and distinguish between good intentions and theories and the associated results will help us all push forward the next iterations on our work. A lack of information often contributes to untrue beliefs. The poor bear responsibility for too many important decisions (such as whether to spend money on vaccinations). Markets are not always friendly to the poor. Many policies meant to help fall short because of the three Is: ignorance, ideology, and inertia. People live up to their expectations. You can find more about the book here: http://www.pooreconomics.com. Thanks to summer intern Stephen Kaliski for this brisk introduction to some of the people and ideas behind this year’s winning IDEAS teams. Kudos all! MIT IDEAS Participants from MIT Global Challenge on Vimeo. Can Information Improve Aid Effectiveness? In 2009 Oxfam America published a brief on “smart development,” in which the authors advocate for increased transparency and predictability in US overseas assistance (ODA). In defining the challenge and the opportunity, Oxfam America identifies three reforms central to their strategy: provide increased access to information to recipient countries; build capacity and help countries lead their own development; and finally let countries lead by opening control. In reading the report, which is a sleek 40 pages, I realize there is a tremendous innovation opportunity here – which is to develop better tools, standards, and administrative reforms that will lead to the kind of information coherence across ODA actors necessary for effective development planning. In a sense, a GPRA for aid that harnesses the open data reforms of the last decade and the flexibility of information sharing tools available on the web. A problem with enough technical challenges to be of interest to MIT management and programming talent? Published on July 9, 2009 in Competition, Examples, inducements, innovation, prizes, research, resources, socialmedia and Uncategorized. Closed Tags: americas-giving-challenge, case-foundation, philanthropy, report, sociagiving, socialweb. In 2007 the Case Foundation sponsored two distinct charity drives across two very different platforms, in part I suspect to change the top-down charity model to one of partnership and engagement and also to stress-test the emerging socialweb as a platform for carrying out its philanthropic interests. In June they released a report on what they learned, titled America’s Giving Challenge: Assessment and Reflection Report. Written by socialmedia guru Beth Kanter – also one of the Challenge’s winners – and tech expert Allison Fine of Demos.org, its a pretty straightforward head-to-head comparison of the performance of both approaches. On the one hand, Case launched America’s Giving Challenge with PARADE Magazine and through parade.com, an example of a mainstream publishing giant adapting to a new Internet reality. The second challenge, the Causes Giving Challenge, was run through Facebook, one of the most popular social networks on the web. Published on April 15, 2009 in Competition, inducements, innovation, prizes, research and resources. Closed Tags: incentives, inducements, innovation, mckinsey, philanthropy, prizes, report. McKinsey and Company recently put out a significant report on prizes as incentives to innovate which is quite good, and very accessible. The report, And the Winner Is, offers a view of the current landscape of prizes and competitions for innovation and provides good insight in good practice. To follow are some notes. Philanthropist matching a clear goal with a large group of potential problem solvers who are willing to absorb some risk. Start with a clearly define aspiration for society benefit which can be translated into prize objectives that are specific, motivational, actionable, results-focused and time bound. A good prize will invest significant resources into its design, specifying the competitor pool, rules and award attributes. An effective prize process is at least as important as the prize design, which will attract candidates, manage the competition, celebrate winners, and publicize the effort. A good sponsor will invest significant resources in post-prize activities that convert the awards result into long-term societal benefits. On 4/3/09 Microsoft Cambridge hosted a seminar on Technology for Emerging Markets at Microsoft Research India (MRI), research.microsoft.com/india. in at least three ways: MRI establishes useful contacts (in India this includes government contacts), it is good for company morale, and research aids corporate strategizing for long-term global growth. The keywords for MRI are immersion, design, evaluation, implementation. Indra Medhi then presented her field research on the use of cell phones among low-level literate people in rural India. She had measured the completion rate of the task of remitting money on cell phones with three different systems: text-based, voice-based, and rich multimedia based user interfaces. Not surprisingly, the text based UI left almost everyone floundering, whereas about two thirds completed the task with the other two. The ensuing discussion brought up a number of issues. The design of cell phones have to pay great attention to sunlight/glare and to audibility in noisy environments. There are cognitive issues relating to the use of softkeys and the concept of layered menues. The are social issues, e.g. that untouchables often think of cell phones as not for them. Most interestingly, imho, were the questions raised about the role of the mediator, e.g. the village telephone lady. They learn accountancy on the fly and quickly become highly competent. Their technical and clerical competence set them apart and give them the opportunity for abuse. So far customers do not seem to mind but this issue may well come to a head. From a design perspective, cell phone design might think about the relationship between mediator and customer, aiming to increase the transparency of the mediator’s activities to the customer, in the process both hindering abuse and increasing the trust.